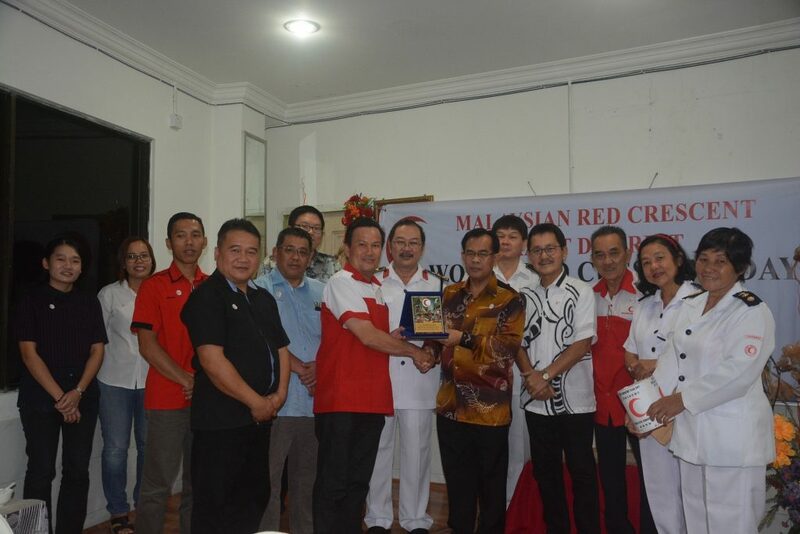 Chairman of MRC Kapit Chapter, Dr Sia Tih Kwong (front row, 2nd left) presents a memento to Bukit Goram Assemblyman, Jefferson Jamit Unyat while others look on. KAPIT: Bukit Goram Assemblyman, Jefferson Jamit Unyat when officiating at MRC Kapit World Red Cross/Red Crescent Day celebration and launching of a Flag Sale at a restaurant here last Thursday evening. “I feel that the theme for this year’s celebration ‘Everywhere For Everyone’ is relevant and timely. To continue to be everywhere for everyone, MRC members must use their global network to strengthen their capacity. So today, while we celebrate this World Red Cross / Red Crescent Movement we will also be reflecting on how we can work with individuals, communities and governments to best support the people who need us, reduce their risks and build resilience, and to improve our services and accountability,” he said. Jamit was also hopeful that MRC Kapit would continue to make its presence felt to champion the noble course and remains relevant in Kapit to assist those in need and he pledged to help in whatever ways to ensure MRC Kapit Chapter to carry out its noble deeds for the benefit of the people of Kapit. “To all volunteers and MRC members here, without you, this movement could not make such a huge difference in the people’s lives in our community and around the world in particular. The World Red Cross and Red Crescent Day is your day, congratulations to all of you,” Jamit said. He also called on the youths to get actively involved in voluntary organisations especially the Malaysian Red Crescent to help others in need. MRC Kapit lauded for its various efforts 0 out of 5 based on 0 ratings. 0 user reviews.